After revealing the ZenFone 4 Selfie and ZenFone 4 Selfie Pro last week, it seems like ASUS is already prepping another variant of their selfie-centric line. 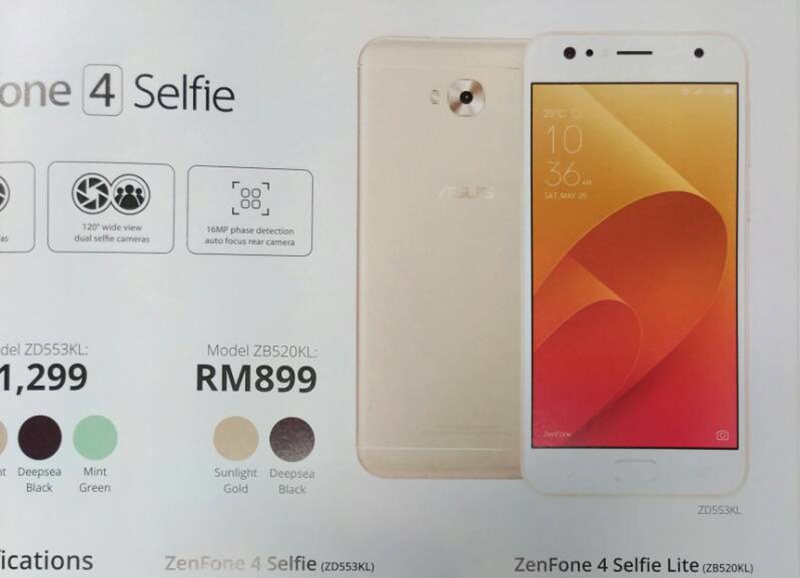 In Malaysia, an image of a certain ASUS ZenFone 4 Selfie Lite appeared together with its colors and pricing. According to Malaysian website Amanz, the ASUS ZenFone 4 Selfie Lite (ZB520KL) will feature a smaller 5.2 inch HD display with Snapdragon 425 quad core processor, 3 GB RAM, and 32 GB of expandable storage inside. Coming from the dual selfie camera setup of its siblings, the ZenFone 4 Selfie Lite will only highlight a single 16 MP front facing camera. Let's also expect it to feature LTE connectivity and fingerprint scanner in front for security. ASUS Malaysia might formally announce it in sunlight gold and deepsea black colors. It could cost for RM 899 which is around PHP 10.7K out of straight conversion. The rest of the missing specs are still unverified for now and we still don't know yet if it will be available in other parts of the world.